Tigerlover's cards and creations: CRAFT Challenge 19, a sketch for you. CRAFT Challenge 19, a sketch for you. For this week our sponsor is , you can find her shop here. Jenni's prize this week is a full set of her digi stamps or any two of her rubber stamps - a great prize I'm sure you'll agree! You can see some of them below. Most of us, if not all, at the DT have used one of her gorgeous digistamps for our projects this week. But now to my card for this week, I hope you like it. I used the penguin for my card and I really like this image. Hope you like it too. 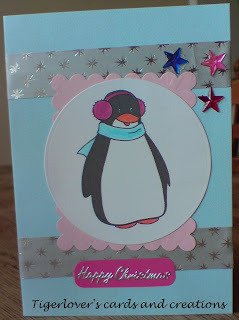 I have used some nestibilities and some Christmassy ribbon for my card. All comments as always much appreciated and very welcome. Have a good weekend and hope to see you at CRAFT Challenge this week. Fantastic card Little Tiger, well done. Fab card Tiger, that penguin is lovely.